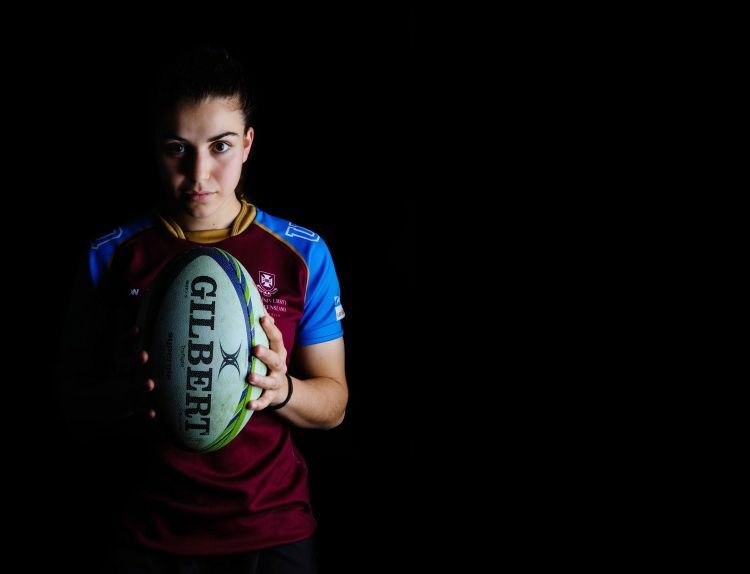 After helping UQ win a silver medal in the 2018 Aon Uni 7s rugby series, UQ student Marioulla Belessis is focused on sidestepping into a new career. Think playing rugby is tough? Try being a primary school teacher. Better yet, try doing both. UQ Bachelor of Education student Marioulla Belessis did just that earlier this year, juggling a nine-week teaching placement at Marsden State School while helping UQ win a silver medal in the Aon Uni 7s rugby series. “I didn’t realise how exhausted I was until I really stopped to think about it,” Belessis said. “Every week went by so quickly because I was so busy. I tried to prepare ahead as much as possible and use any spare time – even as little as 10 minutes – to pull out my laptop and get some work done. UQ finished second behind Griffith University in the 2018 instalment of the Aon Uni 7s series, which saw 10 women’s university teams competing over five rounds. Belessis was one of six UQ students in the new-look UQ squad, and one of 15 new players to join the side since it claimed the competition’s inaugural title last year. “The UQ girls did well last year and won every round,” Belessis said. UQ hosted round three of the series at the UQ Sport Athletics Centre and Belessis said it was exciting to play in front of a home crowd, with her family and friends in the grandstand. “There’s nothing like playing a tournament like this on the same field you train so hard on during the week,” she said. Belessis starting playing rugby as a teenager, while attending Brisbane State High School. She represented Queensland at the National Schoolgirls Championships in 2013 and at the Open Women’s National Championships in 2014, 2015 and 2017. She has worn the green and gold as part of Australia’s Youth Olympics team in 2014 and the Australian University team at the World Uni Games in 2016, and was invited to play for the Tribe team in the Dubai 7s competition in 2014 and 2016, and the Amsterdam 7s in 2015. “The highlight was representing the Tribe team in Dubai in 2014,” Belessis said. While a professional rugby career was a goal for Belessis, serious injuries have meant the 22-year-old has had to reassess her career plans. “I now realise I want to play rugby for the enjoyment and challenge, rather than for a contract,” the UQ Sports Achievement Scholarship recipient said. “I’m in the final year of my teaching degree and I can see myself as a teacher once I graduate. Learn more about UQ&apos;s Sports Achievement Scholarships.